Our competent cleaning technician in Grange Park N21 will analyse your carpeting closely to determine its material and condition. A professional vacuum cleaner is used to take out as much dust and dirt out as possible. Then any removable stains are pre-treated with special stain removal products. All solutions are tested in advance for safety’s sake. Based on your carpet's type either dry carpet cleaning or steam carpet cleaning is carried out. The steam carpet cleaners wash and rinse off the carpet with a hot water extraction cleaning machine. The dry carpet cleaners treat the carpet with dry powder, and then hoover it off. Both are highly reliable carpet cleaning methods made for deep cleaning of synthetic or natural carpet fibres. Steam cleaning involves some drying time, while with dry cleaning, the carpet is ready to be stepped on right after the cleaning is finished. We clean all kinds of rugs and carpets and our services are suitable for residential and commercial properties as well. 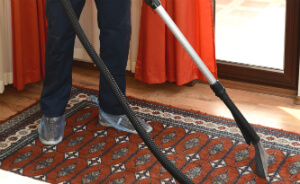 Ever since 2005, Ashlee House Cleaning has been performing professional deep carpet cleaning, including: dry foam carpet cleaning, steam carpet cleaning and carpet spot and stain removal in the entire Grange Park N21. We hire all of our cleaners based on recommendations from trusted source. They are all trained, carefully vetted and constantly monitored for compliance to all of our quality and safety procedures, as well as for following our detailed professional cleaning checklists. We are constantly investing in purchasing the latest, most safe and efficient professional cleaning equipment, instruments and Prochem certified eco-friendly detergents. The carpet cleaning teams can also provide: curtain cleaning, blinds cleaning, drapery cleaning, mattress cleaning and bed bug mattress treatment. We give all of our customers who book several services at a time discounts up to 50% of the cleaning price. People and business owners in the area tend to choose our carpet cleaners Grange Park N21 because we are a friendly, affordable and reliable professional cleaning services provider. We have been functioning for over 10 years and Ashlee House Cleaning has proven itself as one of the leaders in the local rug cleaning business. We will get all types of carpets cleaned in a safe and timely manner. Our services are fully insured, and we work with innovative professional cleaning tools and instruments, along with non-toxic and eco-friendly detergents. We also offer exclusive fibre protection for your carpets with the help of a Scotchgard protection layer. Our cleaning services can be provided on the same day or on any other day of the year. Because we care for our clients, we have a polite 24/7 customer call centre to process all requests for discounts information, quotes and bookings. Go ahead and book our carpet cleaning service today - we will help you rejuvenate, sanitise and prolong the life of your carpeting! If you want to book our carpet cleaning experts in Grange Park N21, you can do it without paying a deposit! All you should do is use the online contact form or get in touch with the 24/7 customer assistants at 020 3746 1366. We have affordable and fixed prices, and will not ask you to pay hidden fees. If you order another one or more of our services along with the carpet cleaning, we will reduce the overall price. Make the most of this excellent offer now and book today.